Usually it’s the late night cable talk shows that tackle the hot button issues that America’s more outspoken people like to rant about, but Jimmy Kimmel Live recently had a segment where host Jimmy Kimmel railed against people who fall into the anti-vaccination camp, and some of those people railed back. 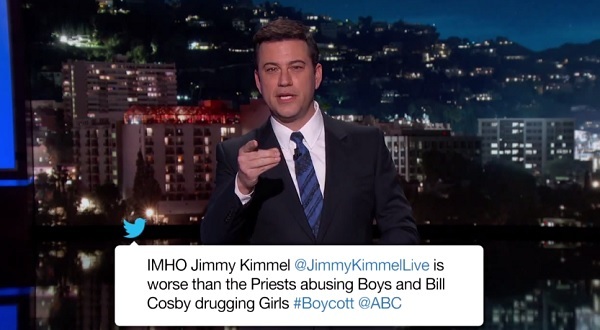 Watch as Kimmel puts himself in the Mean Tweets hot seat. Wow, right? Kimmel usually gets to stand aside and watch as musicians, movie stars and sports entertainers read heinous words about themselves, but he now had to publically face the wrath of his own most vile anti-vaccination critics. I’m sure this was only the cream of the foul-mouthed crop, as well. After all, the only obvious way to express a contrasting opinion about something is by attacking the person instead of the idea, right? No, wait, that’s the opposite of how to do it. Regardless of where someone stands on giving children vaccination to keep them safe from deadly diseases, how on Earth would the following “argument” sway anyone from their standpoint? I don’t think that person realizes that the “H” in IMHO stands for humble. It’s telling that no one is using any kind of science to take Kimmel down, although I’m sure the Mean Tweet community would just assume that any of those tweets were ignored in favor of ones where Kimmel is called a corporate puppet. But it’s not just about Mean Tweets! Kimmel also sends his on-the-street correspondents Jack and Becky on their A Child’s Right to Choose crusade. This gets predictably ridiculous, as they’re asking people to agree with them that children should be allowed to decide whether they want vaccinations or not. (Unsurprising result: no children want to get shots voluntarily.) A childish ploy, to be sure, but the point is made that sometimes adults can’t even be trusted to make decisions. I mean, some of them ignore their own stances and agree to sign the pro-child’s choice document, just because Jack and Becky told them to and because they were on camera. If you happened to miss the previous Jimmy Kimmel Live segment that started all this up, you can watch it below. Now we can presumably expect no more arguments about this subject from now until the end of time, right? Or, at the very least, we’ll probably get some basketball players reading Mean Tweets soon.